It's scary traveling internationally on an expired passport. At least it might have been scary for Anemo had he been aware he was doing it. Of course, it is completely our fault. We've been looking only at the date on Anemo's Permanent Resident Card (his "Green Card"), which expires in 2019, forgetting to check his Ethiopian passport, which expired this past January. Really, we should have applied for Anemo's American passport by now; we just have to get the paperwork and do it. 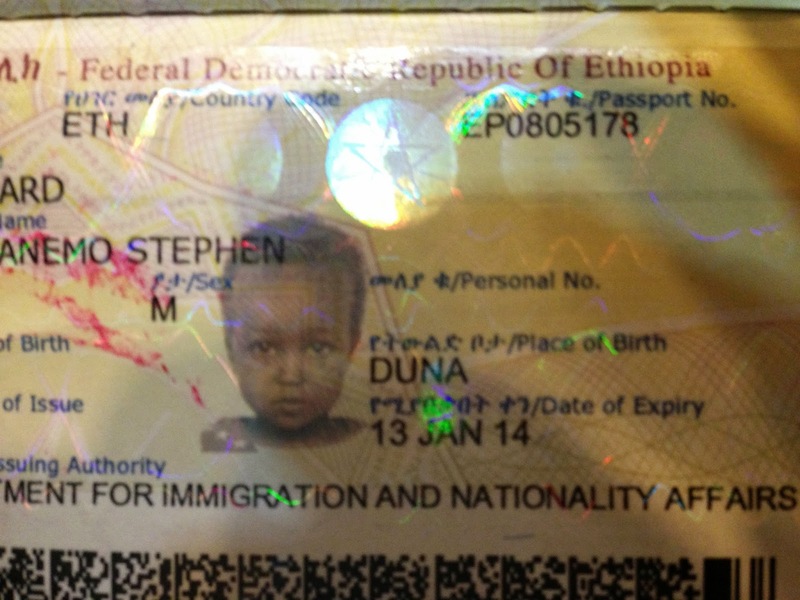 Anemo's Ethiopian passport expired on January 13. Notice that my first name still serves as a placeholder for Anemo's middle name. We have to change that. Suzanne and I were made aware of the expired passport upon entering Curaçao during our recent vacation with Suzanne's parents. We spent a tense 30 minutes waiting for the immigration officer to consult her boss on how to handle the situation. The stern woman even asked us to produce paperwork to prove Anemo was our son. (Suzanne explained to her in Papiamentu that we certainly did not have to prove such a thing!) The end result is that they decided not to stamp Anemo's passport at all. There would be no record that he had visited Curaçao. With no entry stamp in Anemo's passport, we thought we might have a problem leaving the island. When Suzanne handed our three passports to the immigration official, I couldn't watch as she (a different woman) flipped through the pages. Instead, I just listened for the satisfying sounds of the exit stamps...1...2...........and 3. We were through without incident. Now we just had to get back into the United States. Anemo waiting in line to clear immigration in Curaçao on our way home. Usually I am a fairly relaxed traveler, especially at airports. 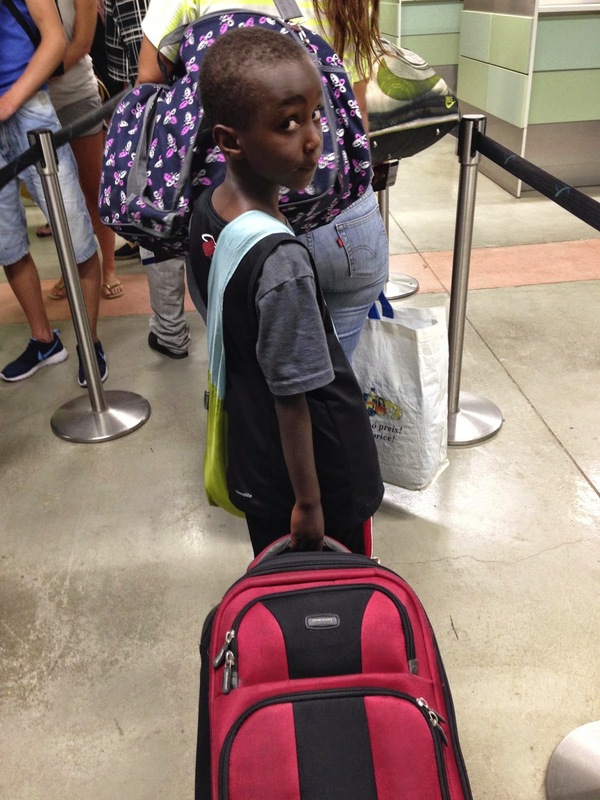 But when I saw another family from California panicking about our short connection time at the Miami International Airport, I started to panic myself. After all, I had budgeted another 30 minutes at U.S. immigration to sort out the expired passport issue. When we got off the plane, I started running through the wide carpeted corridors, telling Suzanne we didn't have time to use the bathrooms. She wisely ignored me and relieved her bladder anyway. Later Suzanne told me that because I had been panicking, she was actually able to relax, allowing her to ignore her usual fear of claustrophobia in the underground labyrinth of MIA. It turns out there was no need to panic. The new automated passport control kiosks relieved a lot of the burden from the U.S. Customs and Border Protection officers, so we breezed through the line. The officer who examined our passports didn't seem to notice the date of expiry either, which dissipated the remaining tension in our bodies. After all the rushing, our flight was delayed by a half hour, so we were able to have a joyless dinner of rice and beans at La Carreta, the Cuban restaurant near our gate. Since we had obviously missed an important detail concerning Anemo's passport, I decided to take a closer look at it when I got home. The first thing I noticed was the prefix የ (ye) before the word ኢትዮጵያ (Ethiopia), indicating possession (i.e. "of Ethiopia"). It is one of the most important syllables in the language and appears everywhere. I also noticed that the other words were transliterations of English (or possibly Italian) words. Like ፓስፖርት (passport) and ሪፐብሊክ (republic). But what confused me was the ዊ (pronounced "wee") at the end of ፌዴራላ (federala) and ዲሞክራሲያ (democracia). The ዊ on the passport indicates belonging to a type or citizenship. So, if you want to write democratic, you would change democracy (ዲሞክራሲ) to ዲሞክራሲያዊ. ስለ (about) ኢትዮጵያ ፖለቲካዊ (political) ኢኮኖሚያዊ (economical) እና (and) ማህበራዊ (social) ጉዳዮች (topics/matters). I still have much to learn about how the ዊ syllable functions in Amharic. I also have much to learn about how to get Anemo an American passport to replace his expired Ethiopian one (the topic of a future blog post I'm sure). In the meantime, we are all waiting for our 15-year-old Haitian exchange student to arrive from Port-au-Prince. We were supposed to meet Sasha Olicha Obagou Charmant this coming Saturday, but we were just informed yesterday that recent problems with the Department of State’s visa issuance system will delay this Haitian student exchange program, which was supposed to run for 10 days. Anemo, who is working on a welcome poster for Sasha, asked today if his temporary "older brother" is still coming to stay with us. We hope the answer is oui. Well you should have kept a check on the date and have renewed the passport. Well thankfully you didn't faced much trouble as it can get very nasty sometimes.